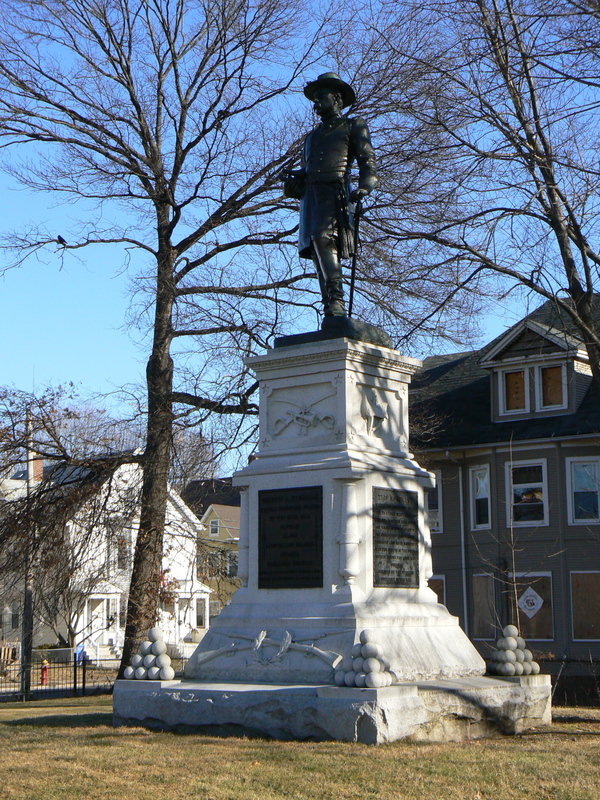 Hartford honors a “typical volunteer soldier” of the Civil War with a monument near the site where many regiments trained before heading south. The Griffin A. Stedman monument in the city’s Barry Square neighborhood stands on Campfield Avenue, which was named for the fields in which several of Connecticut’s volunteer infantry regiments trained. Stedman, a Hartford native, joined the 14th Regiment in 1861 and was appointed a captain in the 5th Regiment. He was promoted four times during the war, and was wounded at the Battle of Antietam. 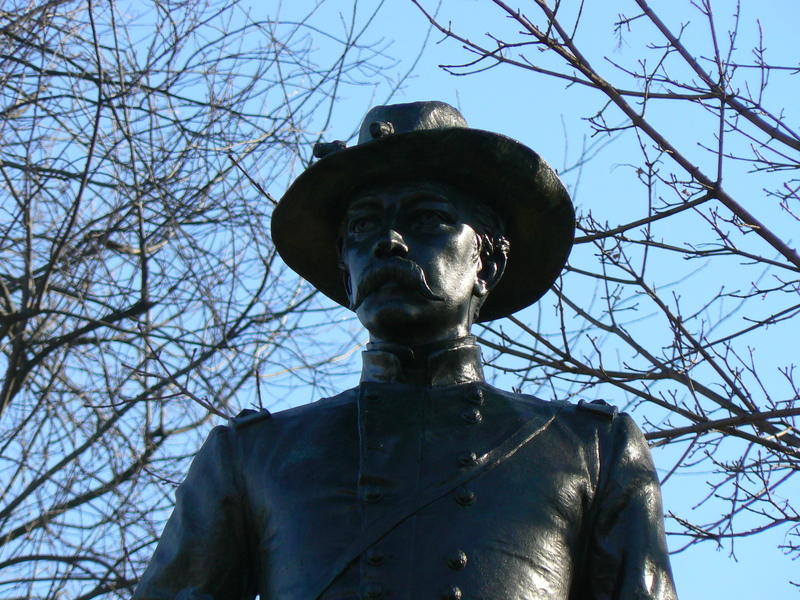 He reached the rank of brigadier general before being killed at Petersburg, Va., at the age of 26. Stedman is buried in Hartford’s Cedar Hill Cemetery. 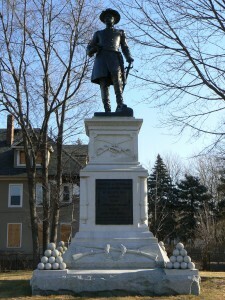 The monument, dedicated in 1900, honors Stedman and the Connecticut regiments who camped in the field near the monument before starting their Civil War service. 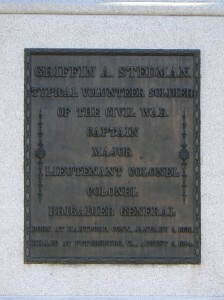 A dedication on the front (west) face reads, “Griffin A. Steadman, typical volunteer soldier of the Civil War. 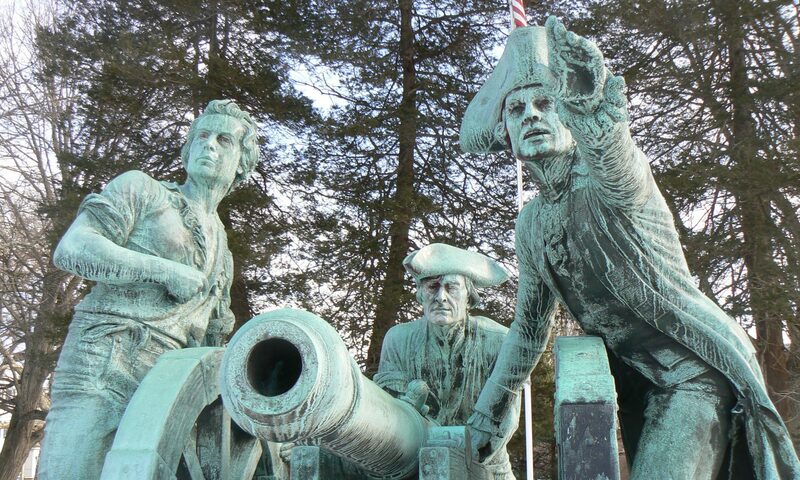 Captain, Major, Lieutenant Colonel, Colonel, Brigadier General. 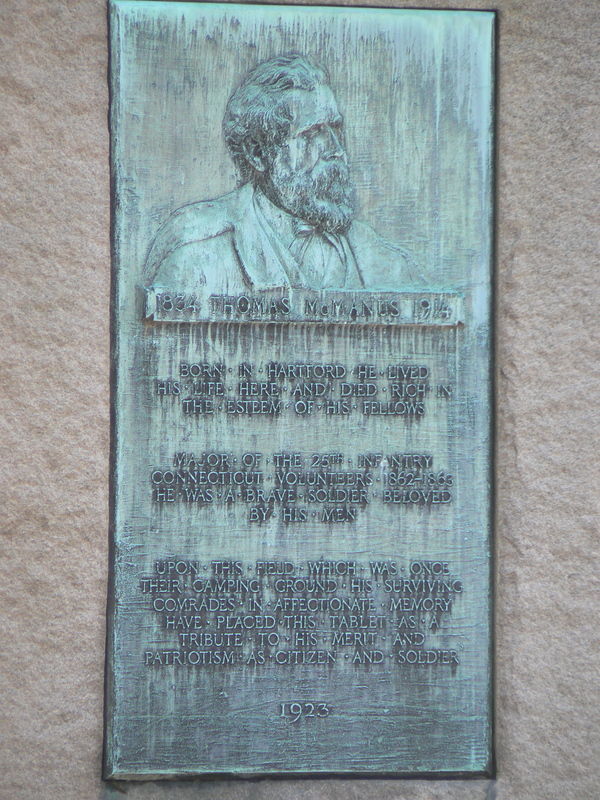 Born at Hartford, Conn., January 6, 1838. Killed at Petersburg, Va., August 5, 1864.” The west face also displays crossed rifles representing the infantry near the base and crossed swords, representing the cavalry, near the top of the base. Gen. Stedman stands atop the monument, facing west with binoculars in his right hand and his left resting near his sword. A bronze plaque on the south face describes the location of the former regimental camp fields, and the east face bears a bronze Connecticut shield. 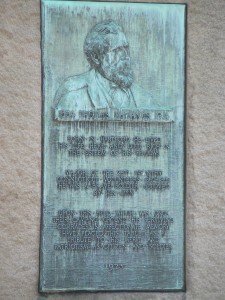 The north face has a bronze plaque honoring the units that trained in Hartford (the 5th, 8th, 10th, 14th, 16th, 22nd and 25th). The corners of the monument’s base bear pyramids of concrete cannon balls. 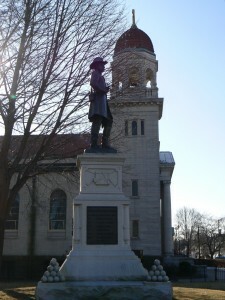 The monument was sculpted by Frederick Moynihan, who also created the JEB Stuart statue along Richmond’s Monument Avenue and two monuments at the Chickamauga and Chattanooga National Military Park. The Stedman monument stands near the corner of Campfield Avenue and Bond Street, next to St. Augustine Church. A marker in the field honors Matthew Arace, a Hartford police officer killed in a 2006 automobile accident. Sgt. Arace, who did community work in the Barry Square neighborhood, is also honored with a bridge on Interstate 91 in Hartford. 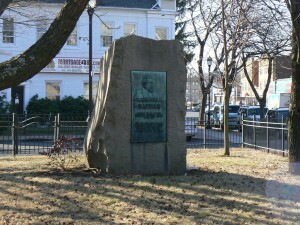 Across Campfield Avenue, a bronze plaque mounted on a granite slab honors Thomas McManus, a Hartford native and Civil War veteran who served as a major in the 25th Regiment. He was also a judge, a member of Connecticut’s General Assembly and director of the state prison at Wethersfield. 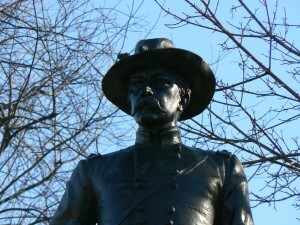 McManus was also active in veterans’ affairs after the war, and was one of the main organizers of the Stedman monument effort. 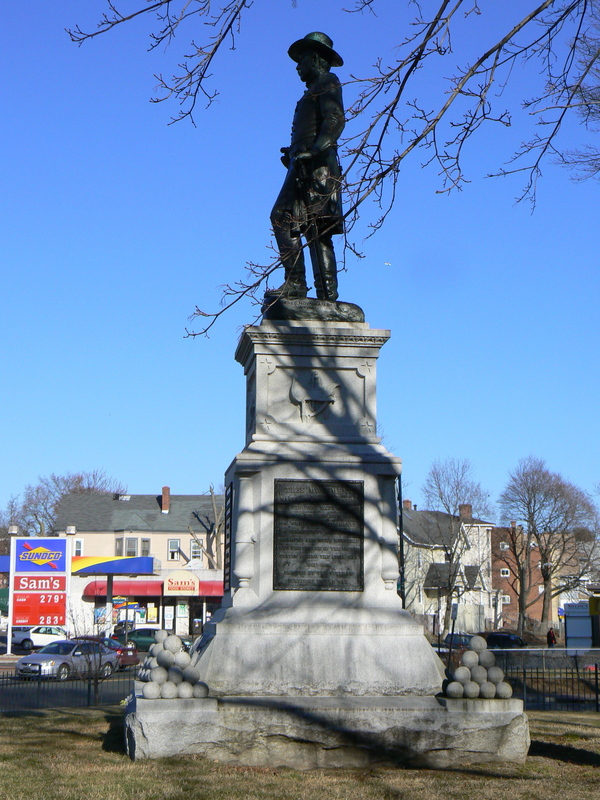 McManus died in 1913, and his fellow 25th Regiment veterans honored him with the plaque in 1923.